The Isku and Kone+ are such a great combo that you will lose key features if you pair either device with another manufacturer’s alternative. Roccat sells the Isku keyboard and the Kone+ mouse separately, but we’re reviewing them together because pairing them is the only way to take full advantage of each product’s features. Roccat’s Roccat Talk technology allows the keyboard and mouse to exchange data so you can execute a mouse macro from the keyboard or map key sequences to the mouse. It’s a great idea, and we dig it, but being limited to just one keyboard/mouse combo is a drag. 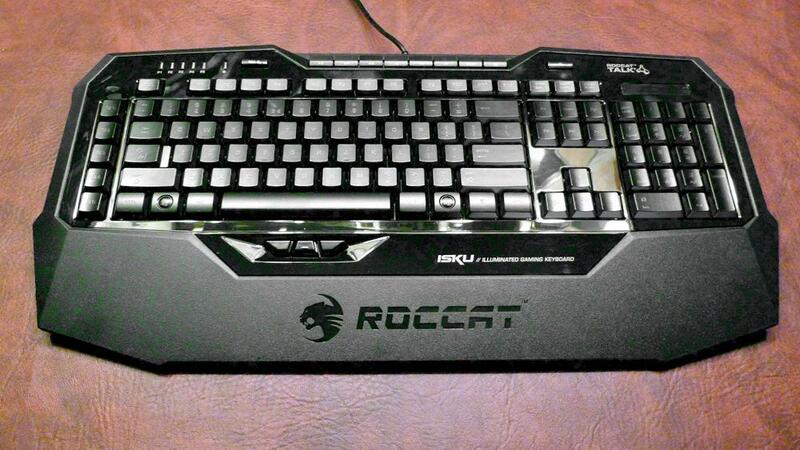 Roccat understands this and plans to introduce more products that use Roccat Talk technology. The Roccat Isku keyboard, retailing at $90, cuts a thin profile as it tapers from 1.25 inches in back to 0.5 inches at the edge of its broad wrist rest. The keys have a surprisingly long throw in spite of the keyboard’s shallow depth, delivering good tactile feedback and a satisfying thunk when they hit bottom. Rubber pads underneath the wrist rest, in the top corners and even on the flip-out feet on top prevent the keyboard from sliding. Unfortunately, Roccat gives you little choice in keyboard angles: You can flip the feet out to raise the front or leave them folded to use the plank in a prone position, and that’s it. Unlike the Steel Series Merc we reviewed in May, which can switch between red, green and purple backlighting, the Isku only comes with a deep indigo. The LEDs shine through transparent letters and symbols on the key caps with five levels of intensity, but the characters are difficult to see at any level. Turn the backlighting off, and the transparent elements become gray against the black keys, rendering them nearly invisible. Roccat squeezes in several custom keys without monkeying around with the conventional key layout. A stack of five macro keys sits on the far left-hand side of the board, and three “thumbster” keys are centered beneath the spacebar. We had no problem moving back and forth between gaming and conventional tasks — with one exception: the Easy-Shift[+] key. It replaces the caps-lock key (we will explain what it does in a moment). But you can create a Windows profile that activates when you exit a game, restoring the key’s normal function. If you prefer that the caps lock always performs its traditional function, you can remap the Easy-Shift[+] key to any of the five macro buttons or to any of the three “thumbster” keys. And thanks to Roccat Talk, you also can opt to activate the Easy-Shift[+] key using one of the mouse buttons (as long as you are using Roccat’s Kone+ mouse). Using the Easy-Shift[+] key, you can assign secondary functions to any of the five macro keys, the three thumbster keys or any of the 20 keys in the WASD zone (the one-through-five number keys in the top row, Q through T, A through G and Z through B). Holding down the Easy-Shift[+]key while simultaneously holding down any one of these keys activates any secondary function you have assigned. If you are playing a first-person shooter, your right hand normally will control the mouse while your left hand controls your character’s movement using the W, A, S and D keys. By remapping keys outside the reach of your left hand to a secondary function of any key that is within reach, you can activate nearly any key on the keyboard using just one hand and never leaving the WASD zone. Pressing one of the five macro keys (numbered M1 through M5 and stacked on the left-hand side of the board) reproduces any series of key presses you have programmed to the key. To record a macro, simply press the record button, choose a macro key, type the sequence of key strokes that make up your macro, and press the record button again to complete the process. The next time you press the M button to which you recorded the macro, your key sequence will replay in real time, repeating the order you recorded. This means that when you execute the macro, you will reproduce any delays that occurred while you were pressing the keys. Both macros and Easy-Shift[+]key assignments can be stored in one of five profiles, and the profiles can be associated with particular games (or with Windows itself). When you launch the gameor exit a game to Windows, the appropriate profile loads into memory. The Kone+ mouse, retailing at $80, is relatively large — it filled my average-sized mitt — but its contoured shell felt comfortable, and its eight programmable buttons were easy to reach. This is a relatively heavy device, designed for right-handed gamers. You can add even more bulk by inserting up to four 5-gram weights (two in a front-to-back orientation and two in a side-by-side orientation). 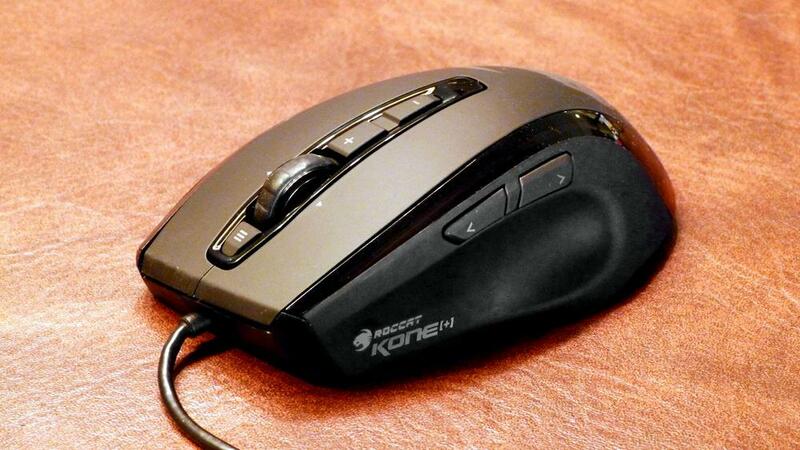 The rubber-coated mouse wheel has a knobby feel that provides good tactile feedback. The mouse can tilt left and right for games that support a lean function, or the mouse can scroll left and right while you use a Web browser or other application. Roccat’s Easy-Shift[+] technology carries over from the Isku keyboard to the mouse. You can assign a secondary function to any of the other seven buttons as well as to all of the mouse wheel’s directions (up, down and depressed). To activate this second function, hold down the Easy-Shift[+] (it is the second of the two buttons on the left side of the mouse), and then press the mouse button. Inline plus and minus buttons behind the scroll wheel enable you to control the Kone+’s laser sensitivity (tracking resolution can vary from 100 to 6,000 DPI). You can use the second side button in front of the Easy-Shift[+] to activate the Kone+’s -Aim feature. This activates a preselected DPI setting to allow for precision aiming, which is particularly useful when you are using a weapon such as sniper rifle. You can locate your target, quickly move into position and then hold down the Easy-Aim button as you look through the scope to aim at your target. As with the keyboard, you can program custom macros to any of the Kone+’s buttons, and these macros can be context sensitive. If you’re controlling a media player, for example, you can use the left and right mouse buttons to move back and forth through a playlist while the mouse wheel controls the volume. As with the keyboard, the mouse can support five custom profiles in its onboard memory. Unlike the keyboard, however, Roccat has written PC software for programming macros and Easy-Shift[+] assignments on the mouse and for customizing just about everything else — including the colors of the mouse’s parallel light bars. Roccat doesn’t force your hand by bundling the Isku gaming keyboard and Kone+ gaming mouse together at retail, but the two peripherals make such a great combo that you will lose key features if you pair either device with another manufacturer’s alternative. The keyboard is moderately priced, but the mouse is expensive compared to the competition — about $10 higher than average. But these products deliver plenty of value for the price.